Pet Friendly Weed Killer: Creating Weed Free Yards That Are Safe! Are you struggling with annoying weeds in your yard but the love you have for your pets is preventing you from properly treating them? We hear you loud and clear and hope this guide will help you find the perfect weed killer treatment that will keep your pets safe while getting rid of those pesky weeks! Years ago it used to be that Dad would run down to the store – grab the first poisonous weed killer he could find and start spraying. Mom kept us kids in the house so we would not breathe it in and we would wait not so patiently until dad said it was safe. Thankfully, today there are so many more options available to homeowners now – from DIY weed killers to organic and poison free store options. Let’s kick off this article below with some homemade weed killers you can make yourself or things you can do to make those weeds disappear! Some even from standard household items. This list features some ways you can kill those weeds with some items you probably have around your home and that are easily implemented with no special tools or accessories needed. The tried and true method of pulling is still one of the best and definitely the safest way of removing weeds. Definitely the most exhausting option – weed pulling is definitely a labor of love and you will use every muscle in your body, but the results are worth it. This is an option that not a lot of people know about and it is one of our personal favorites due to its ease of implementing. Boiling water can kill most annual weeds and a large variety of perennial weeds. A simple spray bottle with white vinegar is also another option for killing weeds – but still keeping you your pets safe! This is probably one of the most commonly used weed killer options by most home owners. Use approximately 1 tablespoon of vinegar for each cup of water you need. Place in a spray bottle and begin spraying. There are variations of this you can utilize as well including oils, liquid dishwashing detergent as well as other options. Misting your weeds – sometimes with a few applications during those sunnier days may be just what you need. When using this option it is important to keep from spraying too much or too often because it may have negative affects on other plants you may have. We have not personally tried this one but have seen many people successfully use sugar to control their weed spread. There is a whole scientific reasoning behind this method – and we will be sure to cover that more deeply in another post as well as a study that suggest this as an option. What we do know is that this method does not work on every weed type, so you will need ensure that you only use sugar as an option on specific weed families. Cornmeal works by preventing weed seeds from germinating – so this can only be used before the weeds begin to grow. Because cornmeal is a non-toxic option, you can easily sprinkle it around your garden and help prevent those weeds from ever starting to grow. Another odd suggestion but apparently it does work well as a non-poisonous option for killing weeds. It is usually suggested to be used in smaller areas so the salt can be diluted – if it is used in too large an area you may ruin the soil conditions for future plant growth. Start with a smaller ratio like 3:1 water to salt and use a funnel or some sort of item that will allow you to make sure the mixture only hits the weed – nothing else. 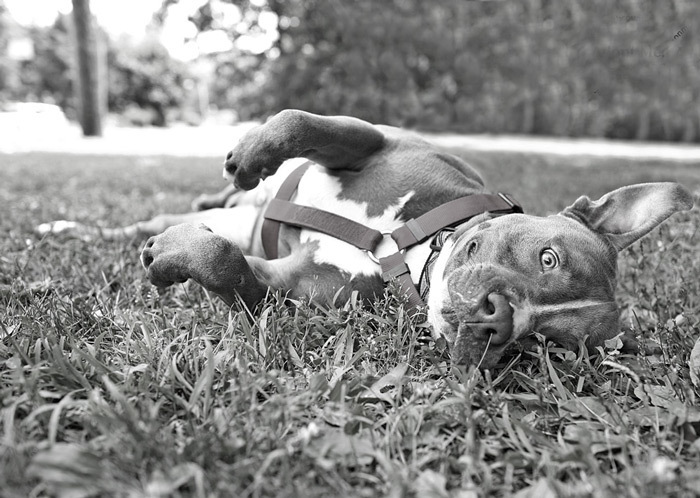 By implementing some of the above – Rover can be sure to roll around safely in his yard. The smile below says it all doesn’t it? Making your own spray is the next step if the above is not an option or not working. Remember not every option will work with every weed – so it may take a bit of time before you find the right option. If you are looking for a more immediate solution it may be a better option to hire a professional who can help you determine your exact weed type so you can get the right solution for your specific weed. But if you are a true do-it-yourselfer, here is a great pet friendly weed killer that you can create at home. Most of the items you probably have laying around your home! Clove Oil: if you prefer to use clove oil then we recommend about 10 drops for your mixture. If you find you are spraying a few times and those weeds are just not dying off – then try doubling the amount of drops you use. Add your drops and then water to the spray bottle give it a quick swish and start spraying! Lemon Oil: because lemon oil is so much stronger then Clove, you should use a bit of caution when working with this option. Mix your vinegar with about 10 drops of lemon oil in a bowl, then add 1 cup of water and mix then pour into your spray bottle. Of course you can double or triple these instructions based on the area you need to treat. It is best to spray this mixture when the sun is the highest in your area – the scorching of the sun will help the weed killer work a little better. Spray directly on your weeds ONLY and be sure to keep the surrounding plants you care about safe as this mixture can affect those as well. Apply daily – and be aware of rain, if it should rain after your application it will be washed away. It is important to remember, although this mixture will not hurt your pets if ingested in a small amount, vinegar and even some oils can be pretty irritating to your pets – so you may want to still limit their time in the areas you have treated after spraying. 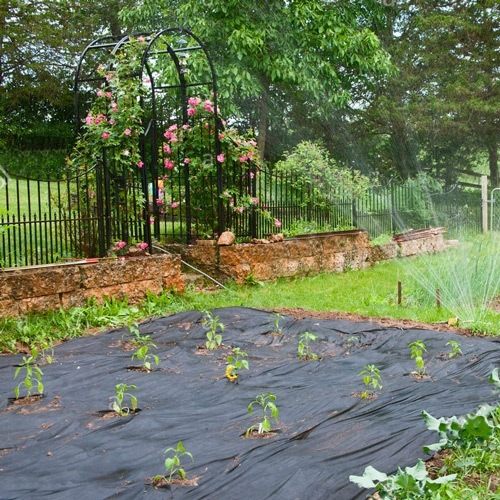 Another option for preventing weed growth is by using what is called Landscape Fabric. While this will not kill existing weeds and of course will not work on full lawns, it is perfect for smaller areas and in areas where it can be hidden. There are many advantages as well as disadvantages to using landscape fabric so it is important to understand both before deciding whether to use this option or not. Weeds can only survive if they have sunlight! Take that out of the equation and you have a better chance of them dying on their own, this is why mulch is such a game changer – and we use a lot of it in our own yard. While this is not commonly used on walkways or pavers – it can be great in gardens, landscaped areas and as an accent around trees. By using mulch in these areas you are essentially “smothering” them and preventing them from taking over! If the options above just do not appeal to you or are not working, there are a few recommended commercial products you can try as well that make claims of being pet friendly. We will review each of these individually to see if we can find any issues with them, but we did want to at least do a brief roundup to help you make a decision about the best alternative for your specific needs. Offers a full line of weed and pest killers that are 100% organic and use plant oils and salt to create mixtures that kill unwanted grass and weeds. You need to use caution with this product because it is a grass killer as well — so if you are only looking to kill the weeds you need to spray it carefully! It is highly recommended for patios and walkways as well as the base of trees and shrubbery. Pets and kids will be kept safe if you allow about an hour for the mixture to dry. The bonus is that it is environmentally friendly and will not hurt any nearby water supplies, mammals or birds which we love. You can learn more about EcoSmart here. A.D.I.O.S. offers a weed killer (or herbicide) that is odorless and claims to be non-toxic. It primarily focuses on what are considered broadleaf weeds so be careful to know what type of weeds you have before making this purchase. It is safe to use just about anywhere including on trees, plants, fruits and vegetable gardens. Once you spray this on the weeds the spray will then travel down right to the root to kill it. It is pet friendly and safe to use around wells and fresh water areas as well. Tell Us About Your Weed Killing Successes! Have a funny story? Have a trick that works every time when killing weeds? We want to hear about it! Let us know what works, what doesn’t and any pet stories related to your weed killing experiences!